Fifth Annual Nexton Cocoa Cup | 5k Events in Summerville SC. 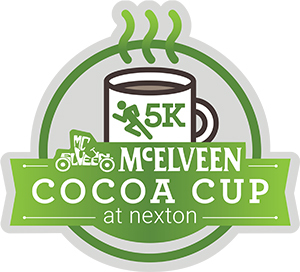 Nexton Cocoa Cup 5K. We hope you’ll join us. Each overall winner will receive a grand prize gift basket and individual prizes will be awarded to the top three finishers in each age/gender category. Plus, kids participating in the family fun run will receive a finisher's medal. Expect a fast course. And a lot of fun. We're excited to report that we have slots for 2,000 runners this year, but we do expect to fill up quickly.